The first use of tools dates to the Stone Age. Humans constructed knives and spear heads for hunting. A anthropologists believe that the use of tools was an important step in the evolution of mankind. Humans evolved an opposable thumb - useful in holding tools - and increased dramatically in intelligence, which aided in the use of tools. Tools have become such an important part of our lives whenever a job needs to be done. 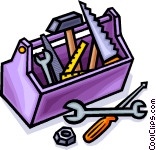 Discover the world of tools with CoolClips clip art!